Is cinnamon your secret ingredient? Made from bark stripped from the laurel tree, it has been in the pantries, larders and spice racks of cooks from China to Rome to Sri Lanka for nearly 5,000 years. Are you a cheesecake aficionado? Your love carries back to the first Olympics in ancient Greece where the Olympian superstars were served a winner’s portion of the delight. AntiquityNOW is pleased to announce Bon Appetit Wednesday! Each Wednesday we’ll post a new “recipe with a past” that has tickled taste buds for thousands of years. Give your weekend parties a distinctive flair with a repast that has a story to tell. Dazzle at potluck dinners with a chocolate concoction courtesy of the Maya. 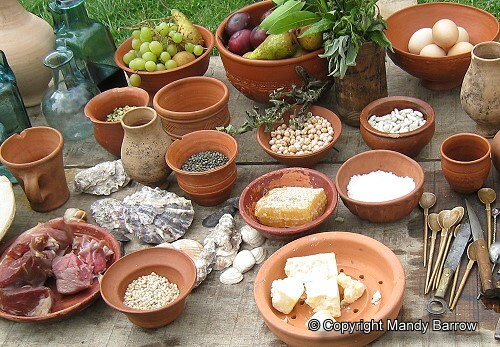 Connect to our ancient ancestors through dishes that can still nurture and satisfy today. By the way, send us your own recipes. We’ll research the origins and give you a shout out in our blog. And just to remind you of how ancient tastes and ingenuity have created today’s culinary fare, here’s a list of some recipes we’ve posted about in the past! This entry was posted in Blog, Bon Appetit Wednesday, Culinary, Culture and tagged ancient food, ancient history, AntiquityNOW, Bon Appetit Wednesday, cheesecake, cinnamon, culinary, Greece, recipes. Bookmark the permalink.